I suppose I need to find a better time to blog than on Fridays because that doesn’t appear to be working out very well. I guess I will try posting periodically through the week, but sometimes I just don’t have anything to blog about. Luckily for you, that is not today. There is plenty to catch up on. 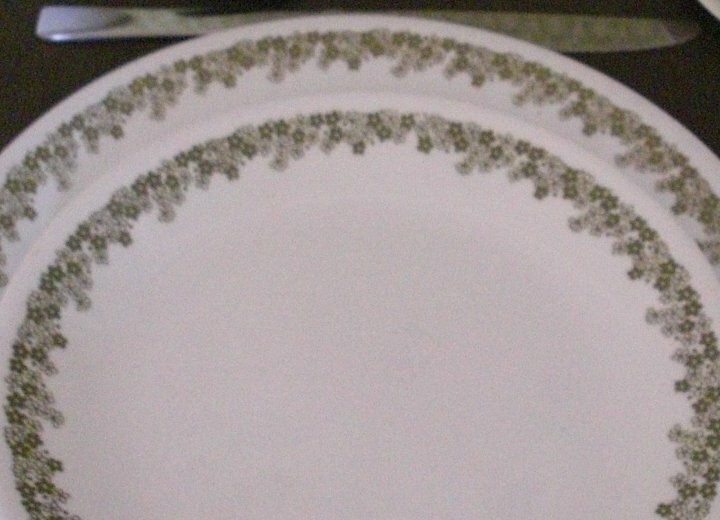 First I will show you a bad picture of my pretty dishes, that I talked about in my last post. I know that they are avacado green and old, but they are really pretty. I love that they are Corelle – light weight, thin, but awesome quality of glass. In other news, I’ve basically completely given up on my sewing machine. It is old and pieces seem to fall off everytime I try to use it, and fixing the mistakes seems to be more effort than just sewing by hand. So that is what I’ve been doing instead -hand sewing everything. 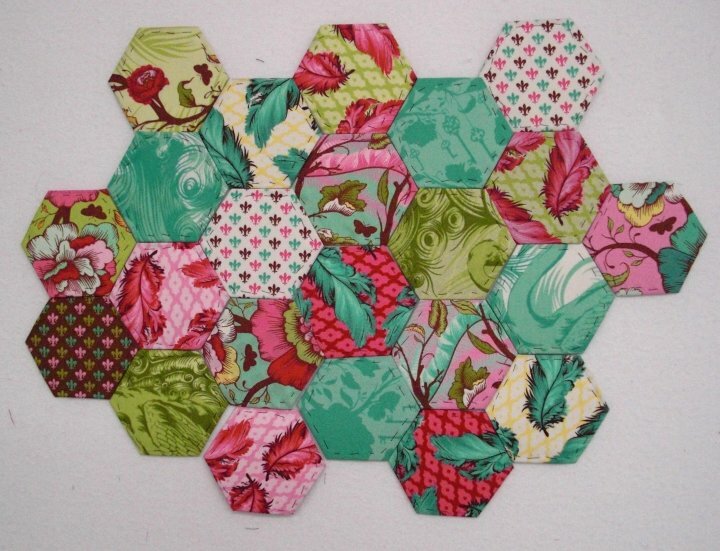 Starting with these hexagons. 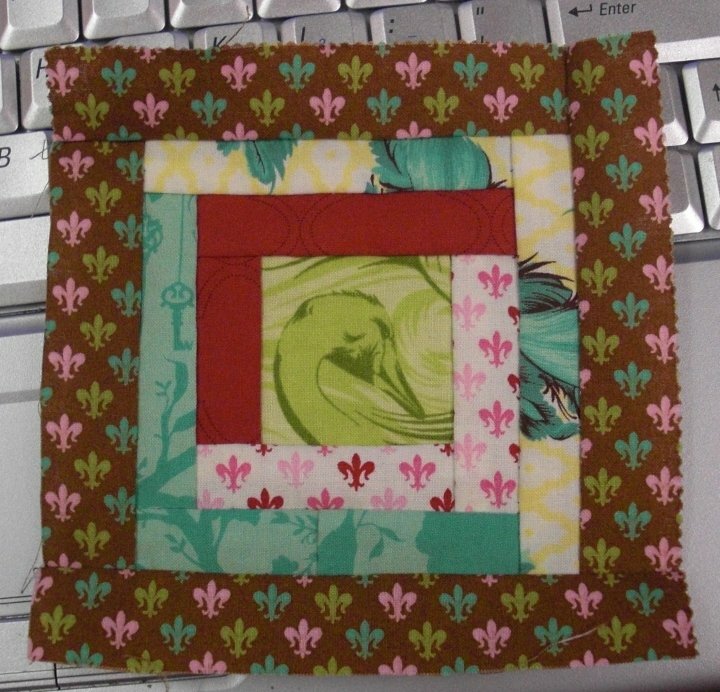 With some of the fabric scraps, since I’m using a layer cake of the “Plume” line by Tula Pink I decided to make a mini quilt block. It measures by about 5″, so 4 1/2″ finished. I’m not sure what I’m going to do with it, especially since I don’t really have enough scraps to make more like it, but it sure is cute. Other than that, the only other thing I’ve sewn in the last 2 weeks is a lunch bag made with some of the blue ornamental oil cloth I bought at the SewFlakes sale in February. When I finish it, I will post a picture.